Now, that you've chosen your wood floors. We now need to look at the features, to make sure it's the right hardwood floor, for you. "Like purchasing a car, we need to know what benefits, that automobile has to offer us. Besides taking us from A to B. Otherwise, all of us would be driving a beater. So we must do the same, here." Texture - Tight grain (ex:Maple hardwood flooring, Birch, Beech, American Cherry hardwood flooring) for smoother appearance (can be slippery when finished) or loose grain(ex:Oak flooring, Santos Mahogany, Brazilian Cherry hardwood floors, Teak flooring) for a more textured look or non slip surface. Grade - Clarity of wood surface, from character such as worm holes , knots, and any natural marks. Wood flooring manufacture, provides different quality - clear, select/better, natural, #1 common, #2 common. Also, 1 rst grade, 2nd grade and 3rd grade clarity. Tongue and Groove - This profile is used to locate each board to another. It reduces vapor flow, coming up from the underside. A quality tongue and groove profile should fit snug, with very little play. If, it has excessive play, passing vapor can cause these edges to dry out, resulting in gapping. Also, if the tongue and groove has excessive play, your flooring can be spongy. The weight of foot traffic can either force the boards downwards or pop them upwards, resulting in uneven surfaces. Even after when it has been sanded evenly to each other. Stress Relief - Groove or fluted profile on the underside of your flooring boards. The stress relief prevents your hardwood flooring boards from cupping, maintaining it's flatness. Stress relief depth should be from 20%-30% of overall thickness, Stress relief along the width should be from 50%-65% of the finished width dimension. This should be a series of grooves or fluted, across the width, not one large groove. Stress relief is important, when your installing wide plank flooring. Wide planks have a tendency of cupping and crowning. If you're using hardwood flooring with no stress relief, consider face-nailing as part of your installation method. Any flooring with a plastic or artificial backing will not nee a stress relief, these are relatively stable material. Finish - The protective coating applied on pre-finished or unfinished hardwood flooring. This will determine how scratch resistant the surface finish will be, just incase you accidentally slide something. Most pref-inished wood floors have Aluminum oxide, applied to it. I recommend investing a extra money on the finish, for on-site finishing projects, if possible. This will help protect your hardwood floors better and make them last longer. If you will be installing your own hardwood floors. Then, you may want to consider the quality of millwork. This will make your job of installing your hardwood floors easier and your floors will look better. Avoid issues like width variation, that can cause a gapping appearance. 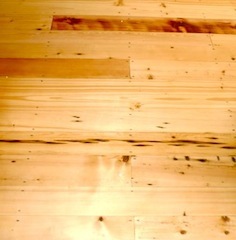 A wood floors's width, only has to be out by 1/64 or less to show gaps in the floor. It can turn a straight row of flooring into a curved one. You'll be struggling to bend a board in place to keep a tight fit and spend a lot of time applying wood putty. A poorly milled thicknesscan make an easy sanding job into a very difficult one. You'll spend a lot of time sanding your wood floors, and you'll reduce the life of it by removing to much material. The more equal the board heights, the less sanding. The less sanding you do, the more life you'll get out of your wood floors. They will last longer. Hardwood flooring companies don't make this information, available to us. Millwork is important - This is how quality is determined on hardwood floors. Visit your local supplier and ask them, for their opinion. They've worked with that type of manufacture's product. Or have had contractors, that has done so. They'll be able to tell you, about the quality of that hardwood flooring and how much work it will require. Every wood floor manufacture is different. Company A's products may be compiled of more shorter (12"-18")pieces, then medium(24"-36") or long(48"-70") length pieces, not so random lengths, millwork has little variation and clarity is exceptional, for a select grade. Company B has an equal amount of short, medium, and long boards (random), millwork much better compared to A and clarity is good. (not so random). Millwork is good and clarity is little bit better, compared to B. Company A has too many short pieces (12"-18") which will provide a more mosaic look and with variation in millwork, you will spend more time, installing your hardwood floors, and too much time, sanding the wood floors evenly to each other (rough and finish pass). Company B has more equal amounts of short (12"-18"), medium (24"-36"), and long (48"70") length boards, which will give a more random look, less repeat pattern, this will prevent a section that will be to busy (great amount of short pieces) or to plain (great amount of long pieces). Millwork is good also, which will make the job of installing and sanding wood floors much easier and faster. Company C has to many long boards(48"-70") floor will appear plain, in certain areas, not so random look. Now this would be exceptional, if you were after this look. The winner here is clearly Company B. Their hardwood floor will give you a random look, has good clarity, Millwork is good, and it's not the highest price flooring. This will make it easy to work with and you'll save money. You don't have to spend a lot of money on hardwood flooring to get a top quality look. As long as you consider all these wood floor attributes. You'll be able to choose quality wood floors for you and your home. Flooring companies will sometimes carry different unfinished hardwood flooring manufactures. Ask for details, about quality, on those particular companies. If, you factor in all these wood floor features. You will be able to choose a quality flooring for your home. You will know that you made the right choice and have peace of mind. If, you're from Massachusetts, I recommend visiting Boston Wood Floors, for your hardwood floors and supplies, then come back. We've only scratched the surface with hardwood flooring information. Find out what type of flooring construction will be best for you.